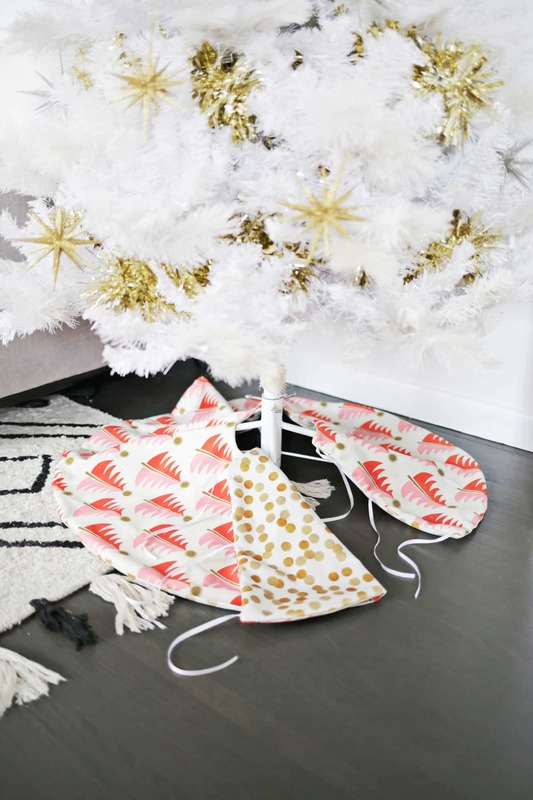 If you think of a Christmas tree in clothing terms, I feel like the tree skirt is the shoes of the tree—it’s a nice little pop of color or pattern that can dress up or dress down a tree just by changing the pattern to suit your mood. 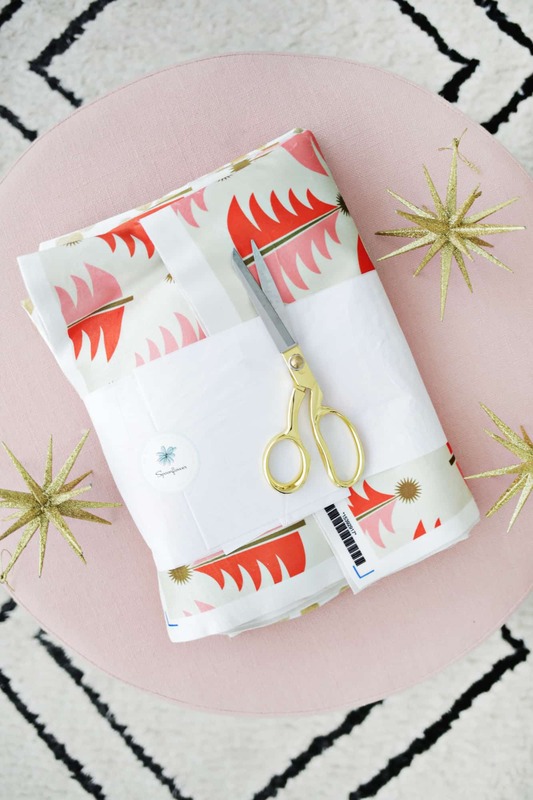 We partnered with Spoonflower on this post, and they’re offering 15% off your next order through 1/31/19 with promo code ABMW15. They have all kinds of color/pattern options, and we’ll share what we picked for this project below! 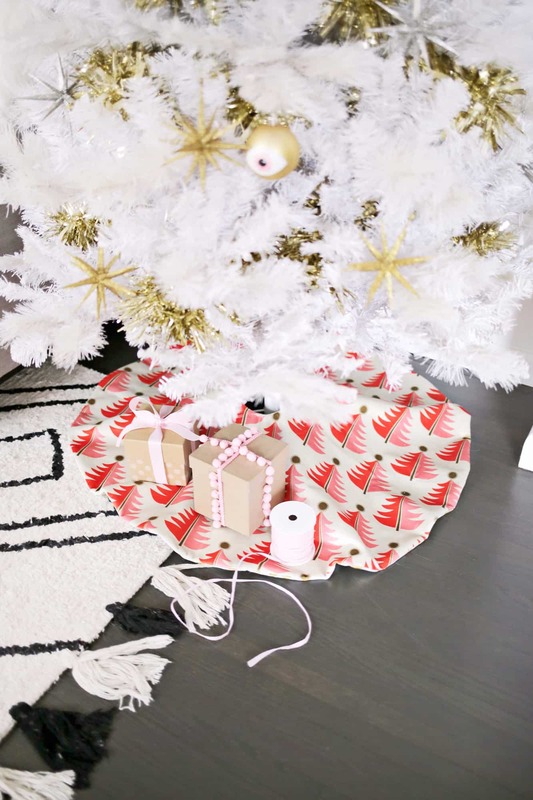 If you’re like me and you always want to have options for everything, then believe me when I say that a reversible tree skirt is the way to go! 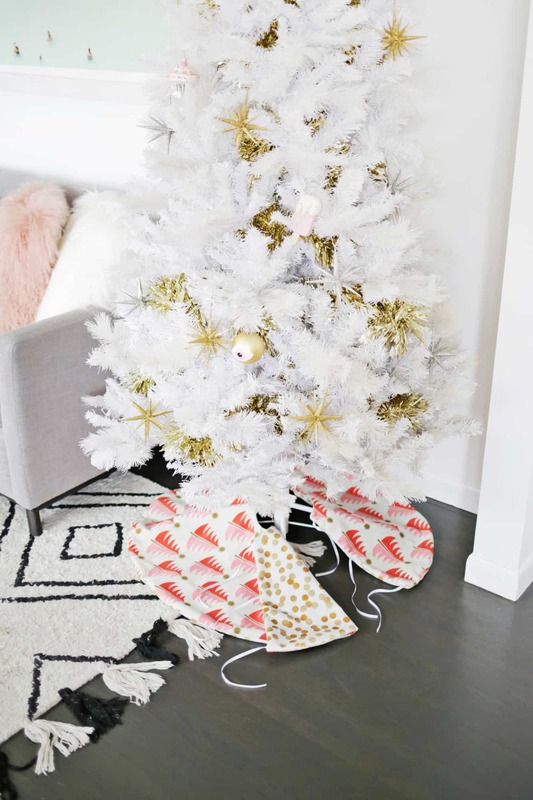 By making each side a different pattern, you can choose which goes with your theme every year and change it up by switching back and forth to make the tree feel a bit more fresh each season. For this project, I used Celosia Velvet fabrics from Spoonflower (velvet always gives things a more holiday feel if you ask me) and I chose this Tree Topped pattern to be a more colorful side and this classic Gold Dots pattern to be a more neutral option for years when I just want to do metallic tones only (and the velvet comes 54″ wide so you can make a large tree skirt if needed). While Spoonflower doesn’t print metallic fabric, ordering shiny designs on Celosia Velvet is a good way to achieve a faux-metallic look. They have sooo many fabrics and pattern choices and you can even design your own fabric if you want! Ok! 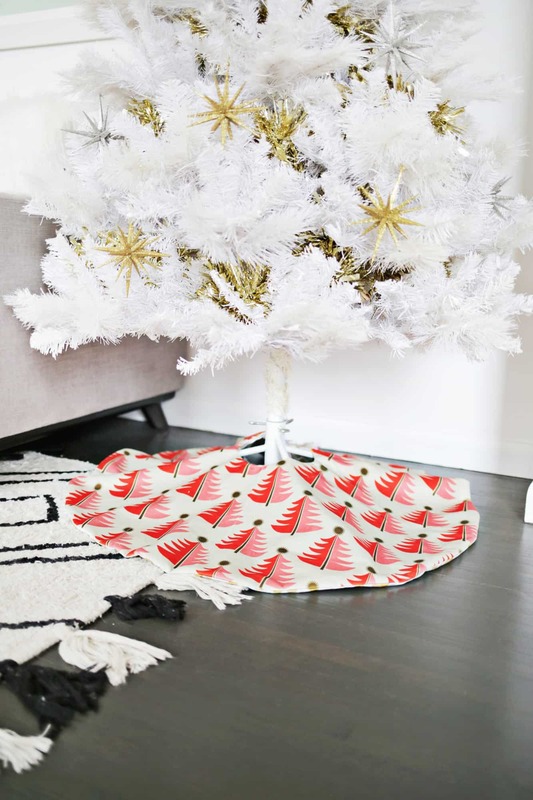 So, I’ll show you how to make the tree skirt, but I’ll make a mini version for you so you can see everything more easily and you can just follow the steps with your full dimensions. Take your two fabrics and lay them right sides together as in the photo above. 1. 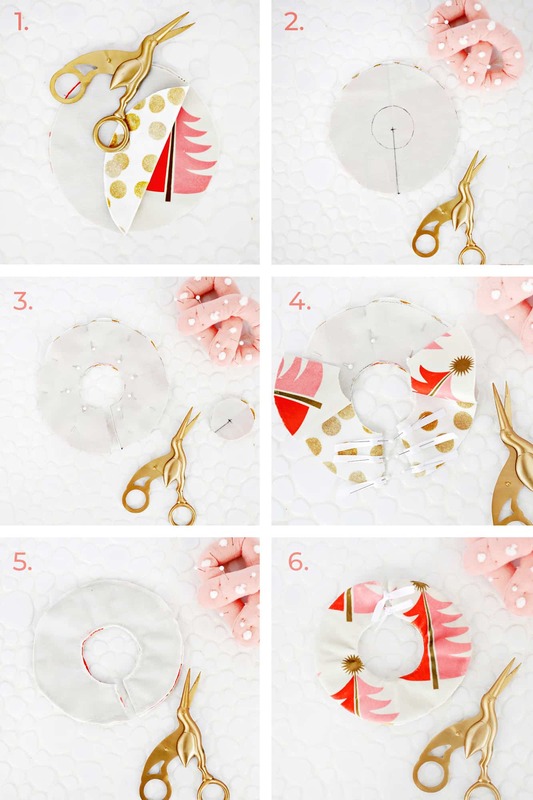 Trace a circle onto your top layer of fabric that’s 1″ larger than you want your tree skirt to be (you’ll have 1/2″ seam allowance around the tree skirt so you want to account for that). These are good methods for drawing large circles without a pattern. Pin your fabrics together (velvet needs a lot of pins to keep from sliding around) to prepare for cutting and cut out your circle from your two layers of fabric. 2. Once your circle is cut out, draw a line from the center of the circle out to the edge (this will be the opening in your skirt) and use a cereal bowl to trace a smaller circle in the center of the skirt for the trunk opening. Add more pins on both sides of the straight drawn line and outside the drawn center circle as well to keep those areas in place. 3. Cut up the straight line to the middle and cut out the middle circle as well. 4. Before sewing around the perimeter of the skirt, cut several ribbons that are 10″ in length to make the closure ties for the skirt (I would suggest either 6 or 4, using half for each side). Place them where you want the closures to be facing the inside of the skirt and leave the edges sticking out a bit so you will make sure to sew them between the fabrics when you sew around the perimeter on the next step. 5. Tuck your closure ribbons inside your skirt, making sure the free ends inside are out of the way of your seam allowance. 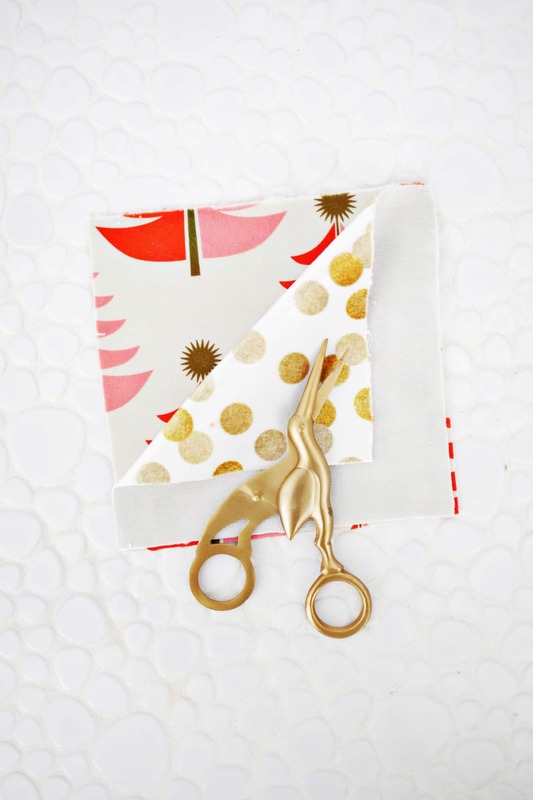 Sew all the way around your tree skirt, leaving a 4-6″ gap for turning the skirt through right side out at the end. Trim off any corners to make those areas less bulky when turned right-side-out. 6. Once your perimeter is sewn, turn the skirt right side out through the hole and either fold in and sew the opening closed with a blind stitch or use a fabric glue to glue the folded-in hem shut. Now you just have to pick a side for this year and decorate the tree!